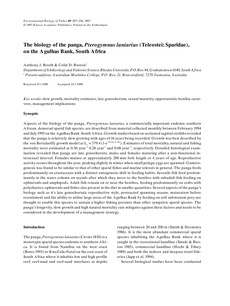 Aspects of the biology of the panga, Pterogymnus laniarius, a commercially important endemic southern African, demersal sparid fish species, are described from material collected monthly between February 1994 and July 1995 on the Agulhas Bank, South Africa. Growth studies based on sectioned sagittal otoliths revealed that the panga is relatively slow growing with ages of 16 years being recorded. Growth was best described by the von Bertalanffy growth model as Lt = 379.4 (1-e�13(t+1.78)). Estimates of total mortality, natural and fishing mortality were estimated at 0.36 year�0.28 year�and 0.08 year� respectively. Detailed histological examination revealed that panga are late gonochorists, males and females maturing after a non-functional intersexual interval. Females mature at approximately 200 mm fork length or 4 years of age. Reproductive activity occurs throughout the year, peaking slightly in winter when small pelagic eggs are spawned. Gametogenesis was found to be similar to that of other sparid fishes and marine teleosts in general. The panga feeds predominantly on crustaceans with a distinct ontogenetic shift in feeding habits. Juvenile fish feed predominantly in the water column on mysids after which they move to the benthos with subadult fish feeding on ophiuroids and amphipods. Adult fish remain on or near the benthos, feeding predominantly on crabs with polychaetes, ophiuroids and fishes also present in the diet in smaller quantities. Several aspects of the panga's biology such as it's late gonochoristic reproductive style, protracted spawning season, maturation before recruitment and the ability to utilise large areas of the Agulhas Bank by feeding on soft substratum prey are thought to enable this species to sustain a higher fishing pressure than other sympatric sparid species. The panga's longevity, slow growth and high natural mortality rate mitigates against these factors and needs to be considered in the development of a management strategy.